Does the shift from on-premise, private clouds to co-location and public/hybrid clouds demand more visibility and operational control than you think you can deliver? Fortunately, data center management tools keep a vigil on power, thermal consumption, server health, and utilization, allowing better control no matter your cloud’s shape. In this session, learn how DCM enables real-time monitoring and precise management to lower operational costs and optimize infrastructure for today even as you’re forecasting for tomorrow. In this webinar, learn how to replace manual, hardware-defined application provisioning and management with a highly automated, software-defined resource model and orchestration layer that enables flexibility, simplified on-demand capital efficiency, and lower TCO. • Collects real-time accurate power and thermal consumption data that gives you the insights needed to manage your HPC clusters power usage and hotspots. • Monitors granular sub-component failure analysis and out of band real-time utilization data (CPU, disk, and memory). It reduces MTTR, increases uptime, and predictive component-level health management. • Intel® DCM SDK can be integrated into HPC job scheduler to optimize power performance while scheduling jobs in the HPC environment. Una rápida evolución de la tecnología complica cada aspecto de la gestión del centro de datos y los modelos de cómputo basados en el servidor son demasiado complejos para las cargas de trabajo altamente variables de hoy en día. ¿Es posible optimizar recursos y operaciones en entornos dinámicos? En esta presentación, aprenda cómo reemplazar el aprovisionamiento y la gestión de aplicaciones manuales y definidas por hardware con un modelo de recursos y una capa de orquestación altamente automatizados y definidos por software que permiten flexibilidad, hacer más eficiente el uso de capital en un esquema bajo demanda y un menor TCO. Descubra cómo agrupar de manera más ágil los recursos de centro de datos, y a la vez, aumentar la eficiencia de TI, optimizar los requerimientos de energía, aumentar la flexibilidad del centro de datos y fortalecer los planes de recuperación de desastres. Does the shift from on-premise, private clouds to co-location and public/hybrid clouds demand more visibility and operational control than you think you can deliver? Fortunately, data center management tools keep a vigil on power, thermal consumption, server health, and utilization, allowing better control no matter your cloud’s shape. In this session, learn how DCM enables real-time monitoring and precise management to lower operational costs and optimize infrastructure for today even as you’re forecasting for tomorrow. Una rápida evolución de la tecnología complica cada aspecto de la gestión del centro de datos y los modelos de cómputo basados en el servidor son demasiado complejos para las cargas de trabajo altamente variables de hoy en día. ¿Es posible optimizar recursos y operaciones en entornos dinámicos? En esta presentación, aprenda cómo reemplazar el aprovisionamiento y la gestión de aplicaciones manuales y definidas por hardware con un modelo de recursos y una capa de orquestación altamente automatizados y definidos por software que permiten flexibilidad, hacer más eficiente el uso de capital en un esquema bajo demanda y un menor TCO. Descubra cómo agrupar de manera más ágil los recursos de centro de datos, y a la vez, aumentar la eficiencia de TI, optimizar los requerimientos de energía, aumentar la flexibilidad del centro de datos y fortalecer los planes de recuperación de desastres. AMAX's [SMART]DC Data Center Manager is the premier out-of-band DCIM solution for the modern heterogeneous data centers, to optimize efficiency and manageability while reducing operational costs and resource underutilization. A rapid rate of change complicates every facet of datacenter management, and server-centric compute models are too cumbersome for today’s highly variable workloads. Is it possible to optimize resources and operations in such dynamic environments? In this presentation, learn how to replace manual, hardware-defined application provisioning and management with a highly automated, software-defined resource model and orchestration layer that enables flexibility, simplified on-demand capital efficiency, and lower TCO. Find out how to compose more agile pools of datacenter resources, and simultaneously drive up IT efficiency, optimize energy requirements, increase datacenter resilience, and strengthen disaster recovery plans. You’re constantly making decisions based on power consumption. How much power is each rack using...and which piece of equipment goes where? You’re dealing with power and cooling costs that are going up...not down. You’re spending money and time on server failures you simply couldn’t see coming. Data center managers face a common problem: too many assets, too little time, and not enough information that’s easy to access and act upon. You’ve got many different pieces...in many different places. With DCIM paired with Environmental Monitoring software, you have one centralized repository from which you can easily pull up the information you need to put all the pieces together, take action, and gain control. Stay on top of server health and make necessary changes before failures occur. Find your zombies servers and kick them to the curb. Lower your power and cooling costs by as much as 30%. Easily access and organize your data center info from one central place. Stop fielding power costs (and preventable server failures) and say adios to all the related headaches and hassle. Substantially lower costs, keep everything chugging along smoothly, and get more out of your time, money, and hard work...and watch the software pay for itself in the first year alone. There is an increasing need to manage the data center environment, given new workloads and increasing demands for efficiency. Hear how Dell EMC is driving energy efficiency into the data center with its leading hardware and software solutions. Learn about the latest updates to Dell OpenManage Power Center, which is available now to help manage and reduce risk in the datacenter environment. The webinar will cover key uses and features of Dell OpenManage Power Center and how you can deploy this tool to improve your operational control. •Monitoring energy consumption, estimating the power demand, and reallocating power to servers as needed. •Monitoring the temperature and cooling capacity of servers and datacenter spaces. •Sending notifications when certain events occur or when thresholds are exceeded. •Limiting the amount of energy that an endpoint or a group consumes using policies. •Optimizing energy efficiency by monitoring real-time inlet temperatures, identifying low-usage servers based on out-of-band power data, measuring power ranges for different server models, and evaluating how servers accommodate new workloads based on the availability of resources. •Reducing the power consumption to a minimum level to prolong service time during an emergency power event (such as a data-center power failure). Rapid change complicates every facet of data center management. Data center managers need ways to monitor, manage, and maintain the health and efficiency of their facility in real-time. They want complete visibility into power, performance, thermals, utilization, location, latency, durability, and security through a single pane of glass. Server-centric compute models are too cumbersome for today’s highly variable workloads. Enter Intel and Schneider Electric’s integrated DCIM solution. In this webinar, you’ll see how Intel and Schneider Electric have worked together to offer an automated, software-defined resource model and support the data center managers with the IT agility and control they need. OpsDataStore is the Real-Time Platform for Data Driven Decisions in IT Operations. Learn how the real-time combination of metrics from Intel DCM (power and thermal), VMware vSphere (virtual and physical infrastructure performance), and AppDynamics, Dynatrace and ExtraHop (application and transaction performance) delivers a holistic and continuous view of the performance and cost of everything in your data center and private cloud – from transactions and applications all the way to storage. Join us to learn how industry leaders are using actionable analytics to remove the guesswork and transform with total clarity and speed. The lack of adequate visibility into data center applications can make it quite challenging and costly to effectively upgrade servers, determine which applications should be in the public cloud and to smoothly transform into a hybrid, cloud-based environment. During this webinar, Intel and TSO Logic will provide practical advice on how to use metrics and automation to optimize application delivery and transform any data center environment — from legacy, to virtual, and complex cloud environments. 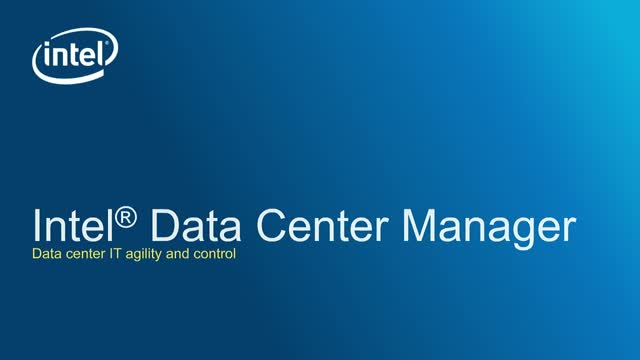 With Intel® Data Center Manager (Intel® DCM), IT and facility managers have the tools to improve manageability, increase availability, and reduce costs across key parameters, such as energy usage, monitoring, security, automation, and cloud. In an era of rapid data center evolution, Intel DCM helps you control and optimize your infrastructure, business models, and operational expenditures.